We plan our cooking courses with great enthusiasm, carefully teaching them to the last detail. And we spice it up so that everyone enjoys it, and it will surpass even the highest expectations. Come learn from us. Our courses are an enriching experience, and are more than just about cooking. You’ll not only learn about ingredients and new kitchen practices, you’ll also meet good people. It’s about sharing recipes, tips for restaurants and cafes, and the passion and love for food that connects us all. Many friendships have been cooked up in Laboratorio, and we are delighted that they have grown from our kitchen into your home. 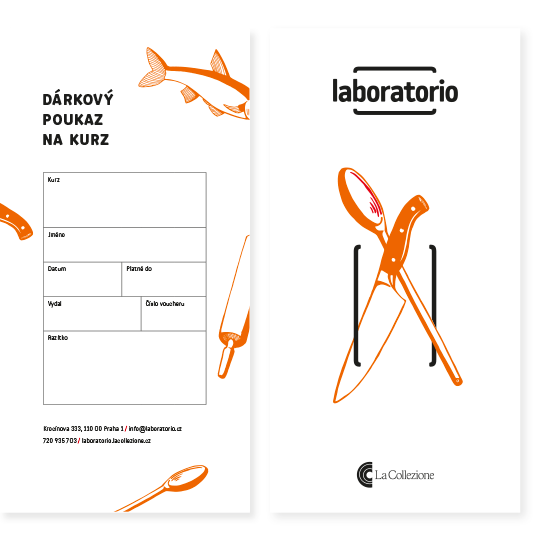 Laboratorio will never leave you empty. You’ll leave full of new ideas, new knowledge, new experiences, a great feeling and, of course, great food and drink. By purchasing this type of voucher, the space for the recipient is automatically booked, and they will be expected. It is possible to transfer this to someone else’s name, change the date, or cancel it completely. All information is available in our Terms and Conditions. Not sure which lesson will suit your friend or family member best? You can buy a gift voucher with an open date, valid for 6 months from the purchase date. The recipient can then choose which lesson and date they prefer. This voucher is 3 300 Kč. Looking for tailor made solution? and we will help you to choose the most propriate offer according to your wishes.